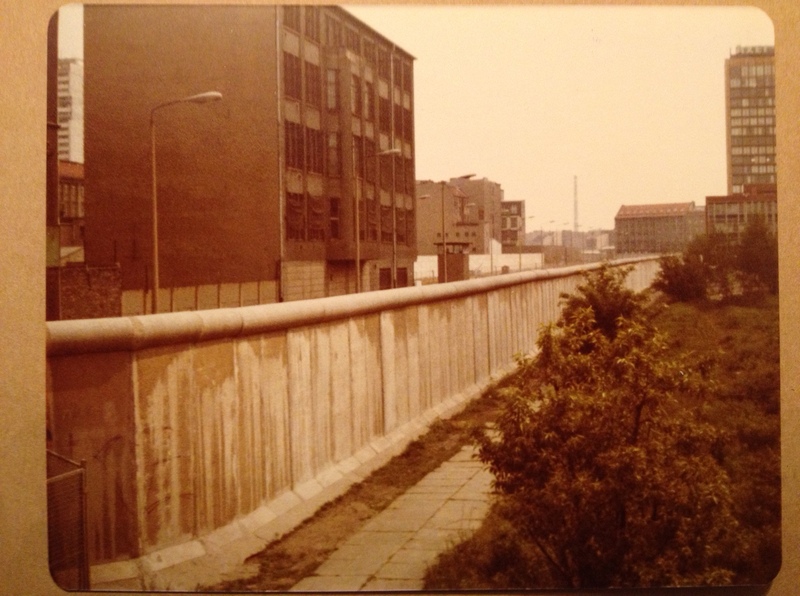 Twenty-five years ago, the Berlin Wall fell, marking a symbolic end to the Cold War. 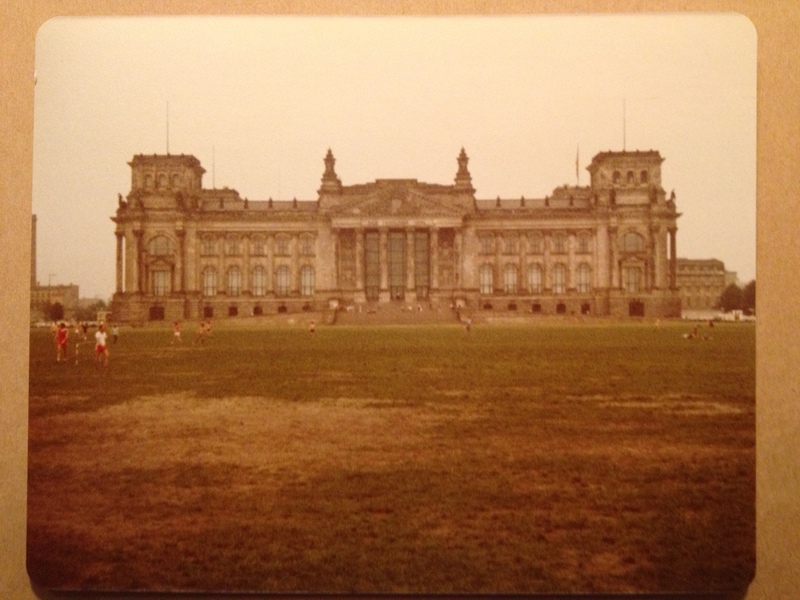 This week’s observances of that event have prompted memories of visiting Berlin in May 1981. A few weeks earlier, I had finished my final undergraduate semester at Valparaiso University’s study abroad program in England, and Berlin was among my stops on a whirlwind trip through parts of the European continent. In 1981 the Cold War very much remained a defining element of international relations, and divided Berlin captured the heart of the era. Although I was but one of millions of tourists to the city during that time, it felt adventurous to be splitting off from my friends for a brief solo trip there. I’ve included some of my grainy snapshots, temporarily plucked from my study abroad photo album. It was possible to get a one-day pass to travel from democratic West Berlin into Communist East Berlin. 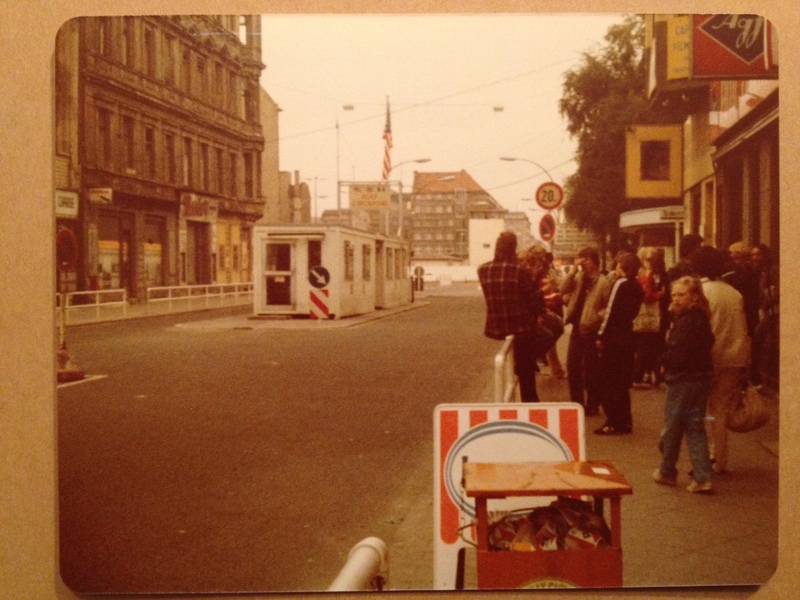 Via the Allied Checkpoint Charlie, you were processed through to the other side, under the watchful eyes of East German guards. You also had to exchange a minimum amount of money, and what you didn’t spend had to be “donated” to the East German government before crossing back to the west side. 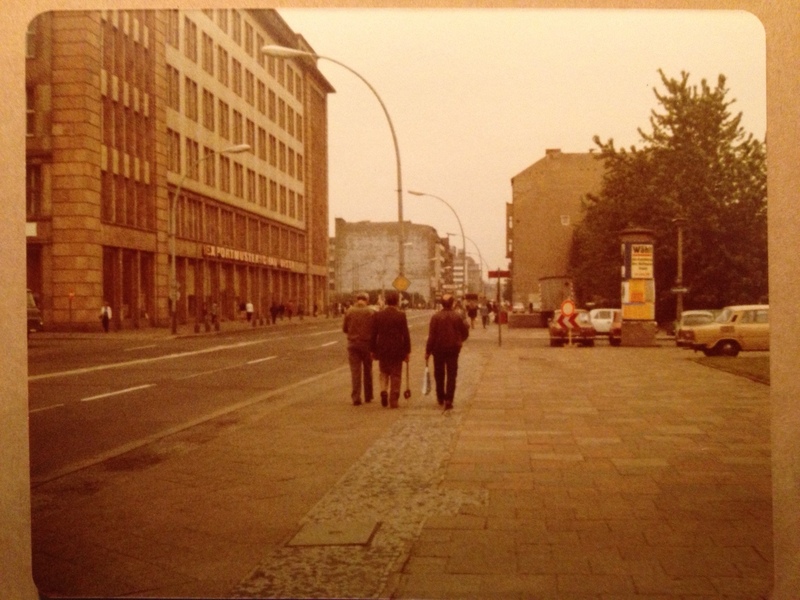 Whereas life in the heart of West Berlin seemed loud and decadent, the streets of East Berlin felt lifeless under Communist rule — as drab and dreary as the photo above suggests. There also wasn’t a lot to spend one’s money on; the (excellent) museums were free and food options were sparse. As my day in East Berlin drew to a close, I still had a fair amount of money left, and I didn’t want to simply hand it over to the East Germans. I thought I had lucked out when I spotted a bookstore, figuring I’d buy a book as a souvenir. However, the only title in English, displayed prominently for folks like me, was a hardcover edition of the complete works of Lenin. So I bought it! I would spend the rest of my European jaunt lugging around that big volume. Though I did bring it home with me, I cannot recall ever reading it before giving it away many years ago! The specter of the Second World War was also very much present. I did a quick tour of the Reichstag building that housed the German parliament until 1933, when a fire of unknown origin prompted the Nazi government to suspend most of the individual rights contained in the nation’s constitution. 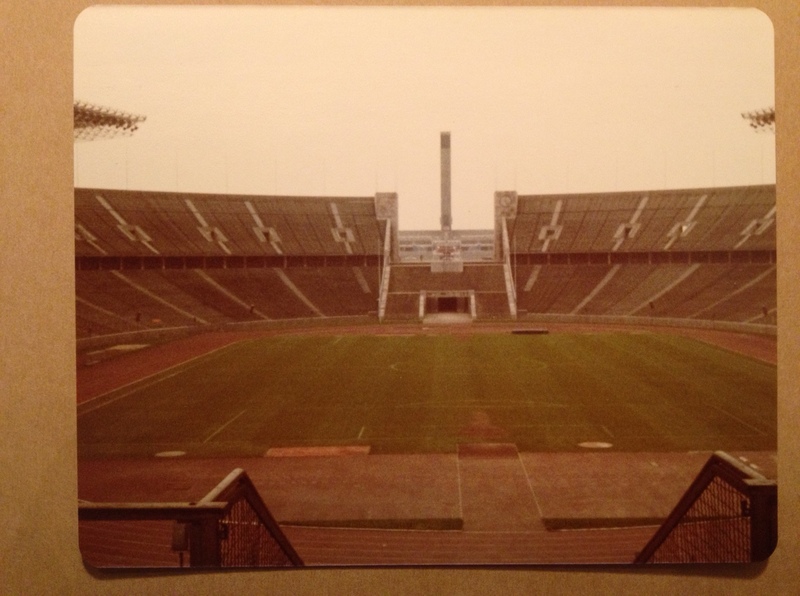 I also visited the Olympic Stadium in which African American track and field star Jesse Owens won his gold medals, achievements said to have undermined the myth of Aryan superiority. I’m very glad that I made Berlin a stop on my European itinerary, but there was something about the city that made me uneasy. I think I felt the energy of so much terrible stuff happening there during the city’s 20th century life. I would return to Berlin in 2011 when I attended a conference at Humboldt University, and I couldn’t shake that disturbing sense even though it had changed dramatically. Some places just have a certain discomforting feel, you know? Thanks for that, Dave. Every time I’ve been in Germany (once, to be honest) I’ve had similar unease, as well as excitement and good connections with friends there.